A close-up of one of the specimens within SCP-2606. Special Containment Procedures: SCP-2606 is to be contained in a storage locker at Site-45. Permission from the current Site Director is required prior to removing SCP-2606 from its locker for testing purposes. When removing SCP-2606 from its locker, caution must be taken due to its breakable nature. Before and after all testing, SCP-2606 must undergo complete decontamination, in addition to a thorough wash with soap and water, in order to remove all dust, residue, and extraneous liquid. Description: SCP-2606 is a drinking glass resembling a conical pint glass, but with a slightly larger capacity of almost exactly 500 mL. SCP-2606 is seemingly sculpted from a single large piece of polished amber. 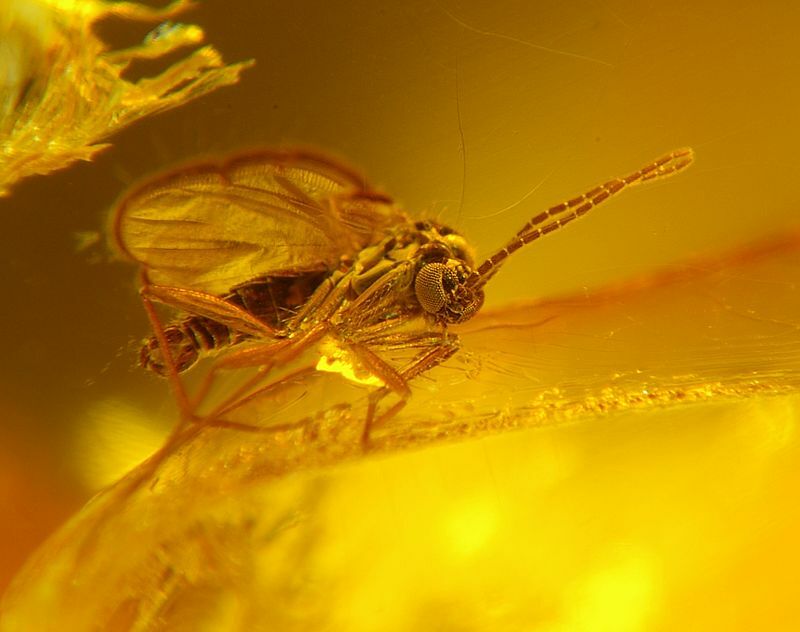 Numerous preserved insects, primarily gnats, ants, and beetles, are trapped within the amber that composes SCP-2606. The species present within SCP-2606's amber indicate that the amber originated in the Baltic region of Germany, and is approximately 38 to 48 million years of age. However, the date at which it was polished and reshaped is unknown. SCP-2606's anomalous effects activate when a human subject ingests the tissues or bodily fluids of animals generally considered "verminous" by eating or drinking them directly from SCP-2606. The animal in question must be one that the subject would not normally eat and that the subject regards with disgust, contempt, or irrational fear1, or that the subject considers a threat to the health and well-being of human beings as a pest, a parasite, or a vector of disease. Animals that have induced the activation of SCP-2606 include bats, most rodents, many scavenging birds (crows, gulls, vultures, etc. ), lizards, snakes, numerous frog species2, and almost all invertebrates, with the only exceptions being those that subjects consider "edible" (crabs, snails, squid, etc.). Consuming animals such as those listed above from SCP-2606 allows the human subject to telepathically detect the mental activity of all living specimens of that animal species within a radius of approximately 10 meters. This ability is exclusively passive; subjects are not capable of communicating their thoughts or mental activity to specimens of these animals. The subject's telepathic detection is constant, and cannot be removed from the subject by any known means. Ingesting animal components contained in SCP-2606 with the aid of an implement, such as a fork or straw, prevents the manifestation of telepathic effects. Physical contact must occur simultaneously between SCP-2606, the animal component, and the subject for telepathic potential to manifest. In addition, if tissues or bodily fluids from multiple animals are consumed simultaneously by the human subject from SCP-2606, the human subject will manifest telepathic effects for only one of the present animal species. Testing has tentatively concluded that physically larger animal species are dominant over smaller ones, in terms of manifestation priority. Discovery: Prior to recovery, SCP-2606 was in the possession of a Mr. Lawrence Salk of █████, ██, USA. Mr. Salk was willingly admitted to a mental health care facility on his family's recommendation after he developed psychosomatic skin irritation and began experiencing what he believed to be auditory hallucinations. Embedded Foundation agents conducted an interview with Mr. Salk upon his admittance into psychiatric care, where he remains as of this writing. Agent Graham: Hello, Mr. Salk. Agent Graham: I said hello, Lawrence. I'm Doctor Graham. Do you know where you are right now? Mr. Salk: Uh… yeah. Yeah, of course. I'm at the hospital. My wife took me here this morning. Agent Graham: Yes, you're at the hospital. Your wife told me you said you were hearing things? Agent Graham: Are you hearing them now, Lawrence? Mr. Salk: What? Oh, uh… I'm sorry, doctor. They're… it's just very distracting. Agent Graham: What are they saying to you? Mr. Salk: I don't know. They're always whispering. I keep trying to listen hard, but even when I hear them, I can't understand it. It sounds kind of like chewing. A lot of chewing. Mr. Salk: That's the thing, too, is that there's so many of them. It sounds like there's a whole crowd of them in there, so they're quiet, but it's still just… overwhelming. That's not… normal, is it? As normal as any of this is, I mean. Agent Graham: Don't worry about that, Lawrence. We'll do everything we can regardless. Your wife also told me that you developed some skin problems. Mr. Salk: What? I'm sorry. Repeat the question, please? Agent Graham: You developed skin problems. Agitation, irritation? Mr. Salk: Oh, yeah, yeah. It's like I feel something crawling on me constantly. It's the worst part, to be honest. Agent Graham: Now, your wife told me that this came upon you all of a sudden, is that right? Just earlier today? Agent Graham: No previous symptoms? No family history of similar conditions? Mr. Salk: No, no! I just sat down in my chair and took a drink from that glass I found the other day, and all of a sudden I started hearing things. Agent Graham: Can you tell me more about it? Mr. Salk: Uh, sure. It was weird. It looked like it had little bugs in it. I mean, not in it in it, but like… inside the glass itself, trapped in there. It was weird, but I liked it. It was unique, you know? Agent Graham: I see. Go on. Mr. Salk: So I took it down and washed it out pretty good, and then a few days later I put some beer into it and took a drink, and then right after I started hearing voices. I mean, almost immediately, too. You don't think that's related, do you? The glass wasn't toxic or anything, was it? Agent Graham: Excuse me for a moment, Lawrence. I have to make a call. All tests were conducted using a different Class D subject unless otherwise noted. Subjects were instructed to ingest the contents of SCP-2606, after which they were presented with a captive living specimen of the animal species they had ingested. Subjects were then instructed to describe the mental activity of the specimen. Result: Feelings of cautious curiosity, described by the subject as "dulled" in comparison to his own emotional capacity. Note: Subjecting the specimen to various stimuli produced the expected emotional responses (fear, happiness, sadness, etc. ), which the subject was able to detect. Subject confirmed that all emotional responses were "vague" in comparison to human emotions. Result: A feeling of extreme dread that did not subside until the specimen was removed from the subject's presence. Result: Physical sensations occurring in bursts of ten to fifty approximately once every five minutes, described by the subject as an extremely painful "piercing" felt in the entirety of the body simultaneously. Note: The same Class D subject participated in both this and the previous test in order to determine whether the effects of SCP-2606 were repeatable. Following this test, the subject was able to detect the thoughts of both M. lucifugus and P. montanus. Result: A series of staccato bass vibrations that increased in frequency and intensity as the specimen was approached by what it perceived as predators or prey. Result: A constant physical sensation that did not vary in intensity based on the specimen's external stimuli. Subject described the sensation as "like someone grabbed my brain in both hands and shook it". Note: Exposure to greater numbers of P. americana caused the sensation to proportionately increase in intensity. Result: A visualization of blue-white lines striking across "the inside of (the subject's) head" and remaining present for inconsistent lengths of time3 before fading. Subject claimed that this visualization could not be suppressed and was extremely prominent and distracting. Visualization subsided when the specimen was removed from the subject's presence. Note: Several days after his participation in SCP-2606 testing, Personnel D-62115 complained of reoccurring visualizations identical to those reported during his SCP-2606 test, and was administered antipsychotic medication. Result: Subject reported that the thoughts of worker ants were audible to her as constant low-pitched drones, estimated at 115 dB, and that queen ants produced no mental activity. Result: Loud sobbing and hyperventilation, ending when the specimen expired. Result: When exposed to a number of living proglottids outside of a host, subject reported three audible notes reminiscent of a marimba, occurring seemingly at random. When exposed to a human host of T. saginata, subject reported a melodious series of marimba-like notes ranging through the entire musical scale. Result: Audible notes described by the subject as similar to "when you blow over the top of a bottle", arranged in palindromic sequences of sixteen. Individual notes were frequently accompanied by between one and eight "echoes". Subject claimed that each note was accompanied by a vivid color, some of which he was unable to adequately describe. Result: A large number of voices4 whispering in a language the subject claimed to be unable to understand, described by the subject as "grumbling" and "unhappy sounding". Subject quickly developed extreme agitation, as well as a constant psychosomatic feeling that insects were crawling on his skin. Note: Examination revealed that SCP-2606 had not been adequately decontaminated since the previous test, and that dust had been allowed to aggregate in its interior. Greater care is to be taken in the future to clean SCP-2606 between tests. 1. Animals feared by the subject that pose a realistic danger to human life (ex. bears, crocodiles, sharks) do not activate SCP-2606's effects. 2. Frog species commonly regarded as "toads" are more likely to activate SCP-2606's effects. 3. Between 1 second and 3 hours. 4. The subject estimated approximately ████████ voices were audible.